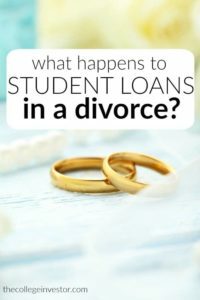 Home » What Happens To Student Loans In A Divorce? When most people take on student loans, they don’t tend to factor divorce into their repayment plan. It’s hard to imagine getting divorced when you’re that you’re young and getting student loans – and harder to imagine it happening before you pay off your student loans. Could life after college be so cruel? But like it or not, plenty of people get divorced every year while still paying back student loans. It’s an ugly reality that can lead to even uglier conflict when neither side is clear on the legalese of the situation. It’s important for anyone in this situation to bone up on just how it all works. It can get tricky, so listen closely – here’s what happens to student loans in a divorce. The bottom line with student loan debt is: the name on the student loan is the one that matters. Even if your ex agrees to help pay off your student loans, you need to double check that they’re making payments. Whoever has their name attached to the loan is the one who will suffer if any payments are missed. That usually means a drop in credit score. There are a few general debt rules that apply to most people regardless of where they live. Any debt incurred before you got married remains your debt, unless you consolidated or refinanced with your spouse during your marriage. If both your names are on the loans, things become a bit more complicated. Some couples refinance or consolidate their separate student loans into one during their marriage. Scott said he recommends splitting those loans up so each person is responsible for their individual loan. “In most states, the divorcing parties can do this any way they want as long as they both agree to it,” he said. There are some cases where both partners can become liable for student debt incurred during a marriage, even if only one person’s name is on the loan. That depends on what the judge decrees or what both parties agree to in the settlement. Local laws vary wildly and can determine if you’re on the hook for your spouse’s student loans or not. Some of this depends on if the debt led to a larger income, enabling both parties to enjoy a higher standard of living. When you have Federal loans, they typically are in your name, and always stay in your name. You are always responsible for your loans. If you get a divorce and are struggling to pay your student loans, switching to an income-based repayment plan may make sense. Here’s the caveat: when you apply for income-based repayment, the Department of Education will use your Adjusted Gross Income from your tax return, unless you opt for alternative income documentation. 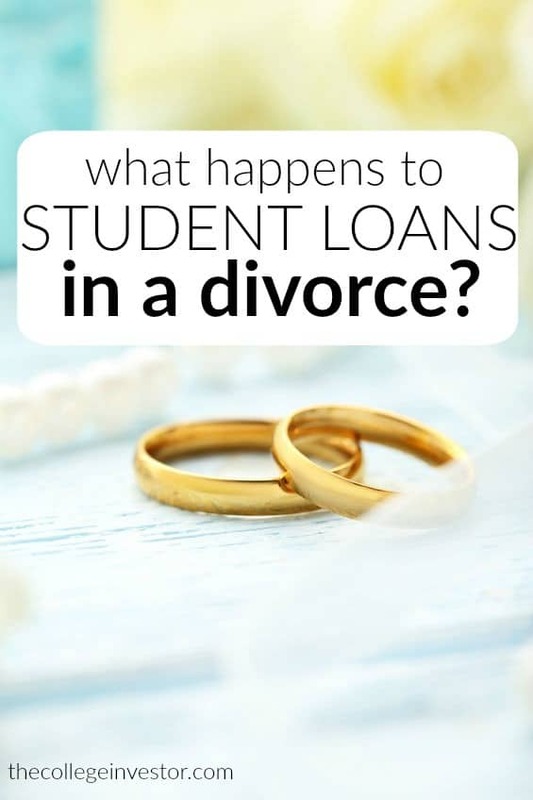 Since the year prior to your divorce you typically filed your taxes jointly, it could artificially inflate the amount of your student loan payment. Another less typical scenario involves spousal consolidation. Spousal consolidation was available to borrowers in the lat 1990s and early 2000s, before Congress banned it. Some people still have spousal consolidation loans, which, like they sound, means that two spouses combined their loans. These loans are incredibly tough to deal with, because they don’t qualify for income based repayment plans or allow consolidation in most cases. The best scenario here is likely to refinance into two separate private loans for each spouse. Private student loans are usually a bit trickier. The reason? The large majority of private loans require a cosigner. For married couples, that cosigner is typically the spouse. So, going back to the rule we discussed above, it’s the name on the loan that matters, since the spouse cosigned, both names are on the loan and both parties are impacted. Some private student loans offer cosigner release, which could be a smart move in divorce. Otherwise, refinancing into a loan without a cosigner will likely be required, but could be tough to do. If you’re needing a loan to refinance, we recommend Credible to compare the various loan options available. College Investor readers get a special bonus of $200 when they refinance with Credible! Couples who have diverging salaries may struggle to pay off their student loans by themselves. If you’re worried about paying your bills after a divorce, decrease your payment plan or file for deferment. Federal loans have many income-based options that can lower your monthly payments. Each private lender has their own repayment plans, but it never hurts to ask what your options are. This is especially true if you find your income bracket changing dramatically after the divorce. The cold reality of student loan repayment may seem harsh when going through a divorce, but try not to let that keep you from making payments on time. Remember, lenders are more willing to work with you while you’re still making payments than when you’ve already missed a few. Consult a lawyer if you aren’t sure what to do about student loans after divorce. They’ll be able to provide more specific advice and suggestions on on the legal side of things. Likewise, a financial planner can help you suss out the financial details. Back in the year 2000 I married. Consolidating your student loans was all the rage. We divorced in 2007. We still share that consolidated student loan debt and have yet to find a lender who will separate the consolidated loan into two separate loans, one in each of our names. As a result, when my credit reports is run it shows I owe the total amount of the consolidated loan. Any tips on who would separate this consolidated loan into two separate loan accounts? Hey Donna, Spousal Consolidation Loans are the worst. There are many local credit unions who will split the loan if you both qualify individually. Several on our best places to refinance will do it as well, including PenFed. What do you suggest when your ex-spouse is no longer working, and you have become the sole person making payments towards loans which aren’t yours? Oh, and your ex can’t be contacted? And why is Congress so reluctant to make it possible to sever loans which they made available 1997-2003? Sadly, you have little recourse except to take the full burden on.